The current location of Temecula (now known as Old Town) came about with the establishment of a railroad depot by the California Southern Railroad. The railroad was founded by a group of Santa Fe Railroad stockholders in 1880. The line began in National City (San Diego) and eventually would end in Colton where it would meet up with the Southern Pacific line. The railroad ran north up to Oceanside and then headed east through Temecula Canyon. It emerged from the mouth of Temecula Canyon (where Temecula and Murrieta Creeks meet) went north along the west bank of Murrieta Creek to Lake Elsinore. There the line headed east again through the canyon where its namesake road runs through (Railroad Canyon Road) on to Perris and then eventually Colton. The construction of the line was completed in August 1882, the same year the Town of Temecula was surveyed by Fred T. Perris. The official survey map was completed December 4, 1882 but not filed until August 24, 1892 in the San Diego Recorder’s Office. 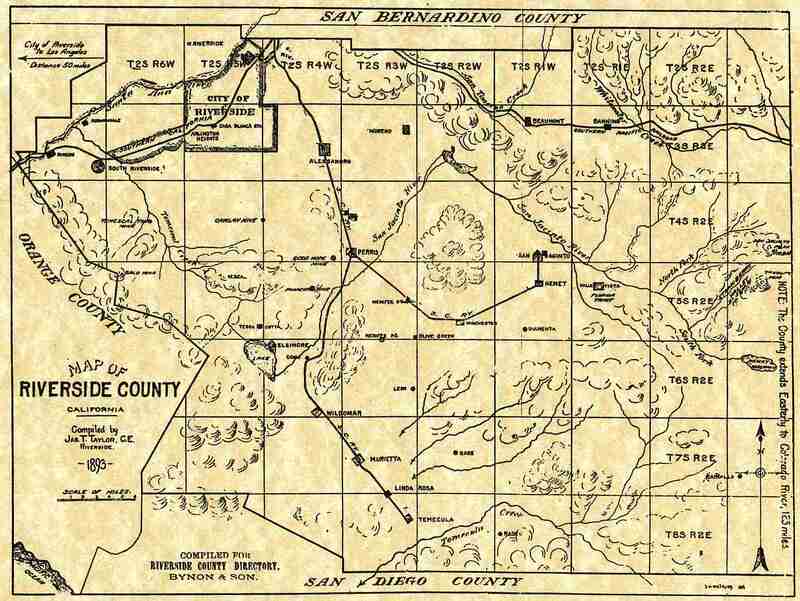 The timing of the map filing coincided with the formation of Riverside County in 1893 which Temecula is now part of. The land that the Town of Temecula sets on was owned by Mercedes Pujol, the widow of Domingo Pujol who had purchased the land in 1879. Besides providing a right-of-way for the railroad, the Pujol family also provided 17 acres for the train depot, 200 acres for the townsite, and 3 acres for the cemetery. Eventually another 6 acres were donated by Mercedes (2 for a school, 2 for a church, & 2 for a plaza). 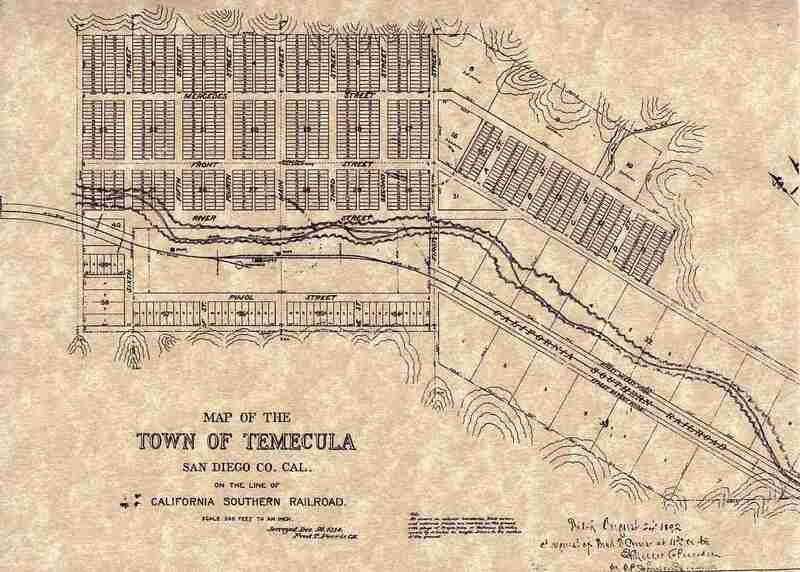 A review of the original map of the Town of Temecula shows that each lot was 25 feet wide by 140 feet deep. The east-west streets were named First through Sixth and Main Street. The north-south streets were named Mercedes, Front, River and Pujol. Main and Front Streets were 80 feet wide while all other streets were 60 feet wide. An interesting aspect is that River Street does not exist today and may never have existed. In 1884 and 1891 there were large floods that eventually caused the tracks through Temecula Canyon to be destroyed. When this happened the railroad no longer ran to National City, the line started and stopped in Temecula. As proof of this the width of the Murrieta Creek on the map is approximatley 115 feet, today the width of the creek at the bridge is 155 feet. Today Old Town Temecula is a vibrant reminder of the past. Many of the original buildings exist in the historic district that encompasses the area of Main and Front streets. It is still a significant stop between San Diego and Los Angeles and remains a wonderful reminder of where the past meets the present.